I’ve just come home from introducing Jacqueline at this event and it filled me with joy to see so many children happy and excited about books and meeting one of their favourite authors. 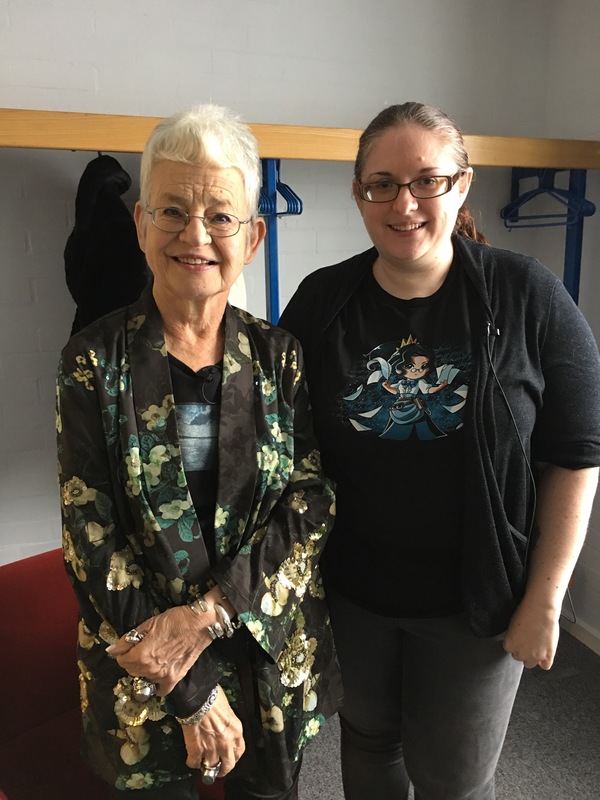 Earlier this week Jacqueline Wilson hosted Blue Peter and added Gold Blue Peter badge holder to her titles of Dame and former Children’s Laureate (2005-2007). It’s quite telling, that when talking about her newest release Hetty Feather’s Christmas, that she couldn’t quite remember if it was her 107th or 108th book! What an amazing achievement, and there’s more to come, Jacqueline told us she doesn’t plan to stop writing. Hetty Feather is one of her best loved characters and was inspired by a trip to the Foundling museum in London. Her other famous character is Tracy Beaker – both book series have inspired popular children’s tv programmes. Jacqueline’s Contemporary and Historical novels don’t shy away from the more unhappy events in life and have their own distinct style. Indeed Jacqueline is pretty sure her English teacher would still be making notes about her use of Slang with her red pen. But this style makes her books real and relatable. I read my first JW book in preparation for the event (I know, please forgive me) and I know a daughter of a friend who has a large collection I will be borrowing more from. The book I read Candyfloss, was published in 2006 and follows a young girl called Floss and the challenges she faces at school and at home. Issues regarding bullying and general healthy vs unhealthy relationships are explored with Floss’ best friend and the new girl demonstrating what friendship really means. Floss decides to stay with her Dad while her mum and her new partner move to Australia for 6 months and during that time her Dad experiences financial difficulties and Floss’ homelife is not as secure as it could be. Her inner struggle about knowing what to do for the best is expertly described. The role of teachers in looking after the social and emotional wellbeing as well as the educational development of children is presented well and hopefully would show teachers in a positive light as adults that children can trust if having difficulties at home or at school. The chapter introduction pages are beautifully illustrated by Nick Sharratt and give hints at what the chapter contains. I’d love to see a full graphic novel collaboration. As well as showing some of the darker sides of life (such as a couple of scenes featuring street violence) there is a good amount of humour and lightness too. Floss’ and her Dad’s relationship with a cat called Lucky and a Candyfloss seller called Rose are very enjoyable. During the event today Jacqueline described her route into the publishing industry starting with magazine journalism (including writing readers letters and telling fellow Sagittarians that they would have a very lucky life). She also answered questions from the audience including advice to future writers about doing things the way that works for you. Over plotting a book, she says, means that she finds writing it a bit boring so she does a rough outline but lets the story come out during the writing process. I hope everyone at the event had a fabulous time. I certainly did. Thank you Jacqueline for your time today. I hope you managed to see a bit of Bournemouth (minus rain) on your way home. 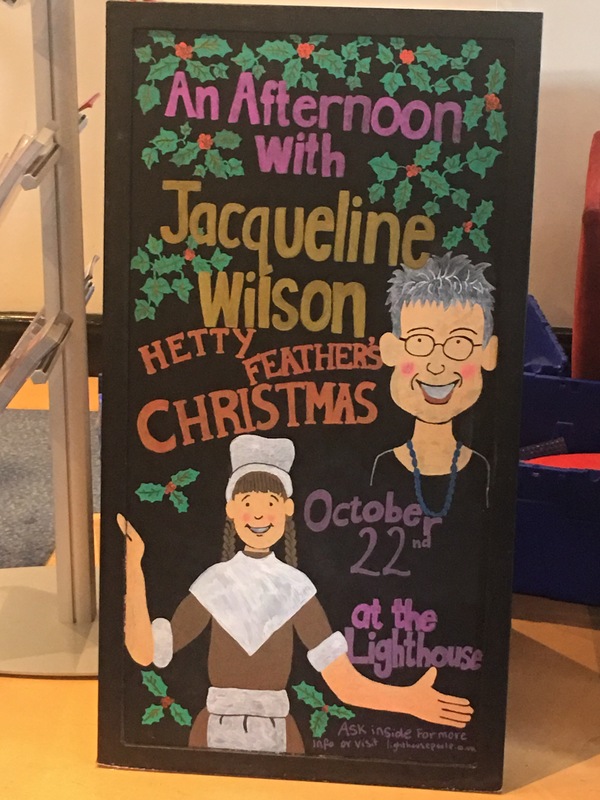 Posted on October 22, 2017, in Author Interviews and tagged Candyfloss, Hetty Feather, Hetty Feather's Christmas, Jacqueline Wilson, Lighthouse Poole, Tracy Beaker, Waterstones Castlepoint. Bookmark the permalink. Leave a comment.